In today’s Outside the Box we’ll continue with our traditional New Year’s forecasting theme, but we’ll look to a couple of European voices – or I guess, especially considering the Brexit vote, I should just call them English voices. Nice, huh? And now back to the future bad news. You’ll find quite a bit of overlap between Ambrose’s and Niels’s worries for 2017, but also some intriguing differences. So now, let me get out of their way and let them give the New Year their best shot. And I remain convinced that, however things develop in our political and economic spheres, we can all achieve some personal bests in 2017. You have a great week, and in a few days I’ll send my own 2017 forecast. The Trump effect is to accelerate capital outflows from China, increasing the risk of a painful reckoning this year. The House will pass tax cuts for the rich but these are regressive, with a low fiscal multiplier. The choice of an anti-deficit Ayatollah to head the budget office implies swingeing cuts to federal spending. These will hit the poor, with a high multiplier. This Gatsby mix is mostly self-defeating in economic terms. To the extent that there is any extra juice, it will be countered by the Fed at this late stage of the cycle. Tight money will push the dollar higher. Once markets accept that Trump is not bluffing – that he really does intend to smash globalism – euphoria will give way to alarm. For now Wall Street remains drunk on wishful thinking. The longer the delusion lasts, the stronger the dollar, and the greater the trouble in Asia and Latin America. Such is the currency paradox. 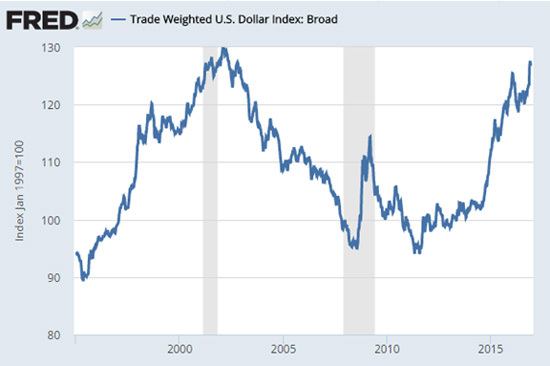 As the Fed’s broad dollar index pushes towards an all-time high of 130, the mechanical effects will expose the Achilles Heel of an international system that has never been more dollarized – and never been more sensitive to US interest rates since the end of the Bretton Woods era. King dollar will tighten the noose on emerging market debtors with $3.5 trillion of liabilities in US currency. It will force banks in Europe – through complex hedging contracts – to curtail offshore lending to the Pacific Rim, Turkey, Russia, Brazil, and South Africa. It will lead to a credit crunch in the developing world. China moves to a different rhythm but it cannot hide from higher US rates. The imported squeeze will come just as the latest 18-month boomlet rolls over, a form of pro-cyclical tightening on a Chinese economy that has already reached credit exhaustion. It is whispered – and always denied – that the US agreed last February in Shanghai to delay rate rises, buying time for the People's Bank to calm the yuan panic. The Fed retreat worked like a charm. Markets did indeed stop worrying about China. Global bourses rebounded. Next time – and it is coming soon – there will be no such accord. 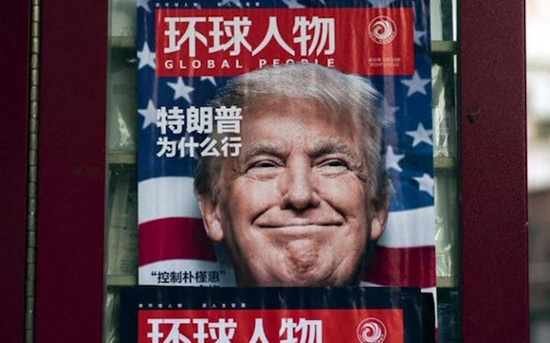 The Trumpians want China to blow up, thinking they can handle the blow-back. They can't. Draconian controls by the People's Bank will not be enough to stem capital flight. Nor will reserve losses blowing past $100bn a month in January. The nuclear risk through 2017 is that Beijing's ‘weak yuan’ mandarins will prevail. If they let the exchange rate go completely, the Asian currency storm that must inevitably follow will unleash a deflationary tsunami through the world. I think China will hold the line, but don't bet on it. China's slowdown will kill the commodity rally stone dead. Saudi Arabia and Russia will find that output cuts agreed in Vienna are not enough to clear the oil glut this year, pushing off the desperately-awaited rebalancing into the distant future. Neither country can handle the implications of this. Riyadh will buckle before Moscow. My New Year’s piece last year spoke of sunlit uplands: “The economic sweet spot of 2016 before the reflation storm." I hoped the treacherous moment could be deferred until 2017. Unfortunately we are now almost there. The tailwinds of global recovery are fading whatever equities purport to tell us. JP Morgan's 'Nowcast' measure of world growth was been slipping quietly for the last six weeks and is now down to an anemic 2.6pc, even before the China's credit curbs kick in and the Asian slowdown becomes obvious. We have already enjoyed the $2 trillion consumer windfall of cheaper oil. Europe has already enjoyed austerity relief. The European Central Bank has already played its cards. On a flow basis the ECB will soon be tapering, and therefore tightening. Yields on Italian debt will climb well above the growth rate of nominal GDP – the fatal threshold – as markets anticipate the loss of the ECB shield. This means attrition on €400bn of sovereign paper held by banks, eroding capital buffers. Rome’s €20bn fund for bank rescues will run dry within months, and the political costs of a second bail-out will be much higher. It will become clear again that Euroland has resolved nothing. The fatal pathologies – lack of fiscal union, lack of a banking union beyond the name, the one-side adjustment imposed on the South, Germany’s unpunished current account surplus – have merely been veiled by QE and the Draghi Put. None of the elections in Holland, France, or Italy will bring an anti-euro government to power, but they will come close enough to rattle nerves and drive the euro below dollar parity. The parliamentary balance of power will shift, greatly weakening the ideological lockhold of the Maastricht elites and free movement purists. Alternative fur Deutschland will make it into the Bundestag. The centre-Right will harden everywhere to stop leakage to the populist fronts. Brexit Britain will no longer stick out in quite the same way. It may even start to look like a liberal haven set against Europe’s unanswered rage, and this will change the narrative. The threads will become confused, the pieties of Remain less certain, the Scottish temptation a little less alluring. The UK economy will not perform any better than the eurozone in 2017, but it will not do any worse either, and those who talk of ‘punishing’ Britain in EU capitals will discover the asymmetry of political risk. The British can perhaps fall back on the Dunkirk spirit. Brussels can fall back on nothing. The next global downturn will come before the G4 central banks have been able to replenish their ammunition, while the bar on New Deals or budgetary largesse is dauntingly high. World debt ratios are already 35 percentage points of GDP higher today than they were at the top of the last cycle in 2008. 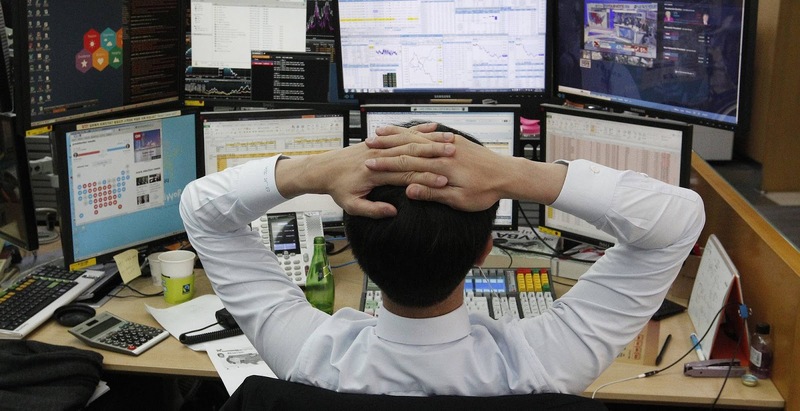 Emerging markets cannot come to the rescue as the did after the Lehman crash. They too are now mortgaged, and psychologically battered. As polities fray, those nation states with an organic cultural unity and strong allegiance to sovereign institutions will fare best. Utopian constructions and brittle dictatorships have less margin. Will we make it through 2017 before the reckoning hits? Probably, by the skin of our teeth. 1. The high yield default rate exceeds 25%. 2. Brexit never happens as the UK Bremains. 3. Italian banks are the best performing equity asset. I am not into making outrageous predictions myself but, if I were, and given the fact that I have a rather wicked sense of humour, my outrageous prediction # 1 for 2017 would probably be for either David Cameron or Hilary Clinton to participate in the 2017 edition of BBC’s flagship entertainment show Strictly Come Dancing. As Ed Balls just learned, that particular show provides an excellent platform to resurrect a fading political career (he probably got more votes for his dancing skills than he did in the last parliamentary elections, but that is an altogether different story). Having said that, only last month did I promise not to make fun of politicians anymore, so let’s drop the ball right there. Even if 2017 is not likely to be particularly high on entertainment value, it could certainly be high on drama, which makes this Absolute Return Letter particularly challenging. As you may recall from previous years, the January letter is always about the mine field laid out in front of us. What could cause 2017 to be a year to remember? What could possibly go horribly wrong? At this point in time, I see many potential problems. I have some concerns about the US. I see dark clouds gathering over Europe, and I see very slippery conditions in many emerging markets (‘EM’). In other words, lots of markets around the world appear to be accident prone but for very different reasons, which I shall get back to in a momento. However, before I go there, let me share with you a glimmer of hope; a twinkle of optimism that you don’t find too often in the Absolute Return Letter. Not that I am a born pessimist – actually far from it. I just learned many moons ago that, when it comes to investing, good news is the last thing you should spend your energy and resources on. The secret to being a good investor is to focus on risk management and to be well prepared for bad news. Long term readers of the Absolute Return Letter will know that I have always been of the opinion that we have never properly exited the global financial crisis (the ‘GFC’) of 2007-08. One of the conditions I have used to make my point is the high correlation between risk assets, and how life as an investment manager has become complicated as a result of that. Prior to the GFC, you could fairly safely assume that diversification across a number of risk assets would dramatically reduce the overall volatility risk, but not anymore. 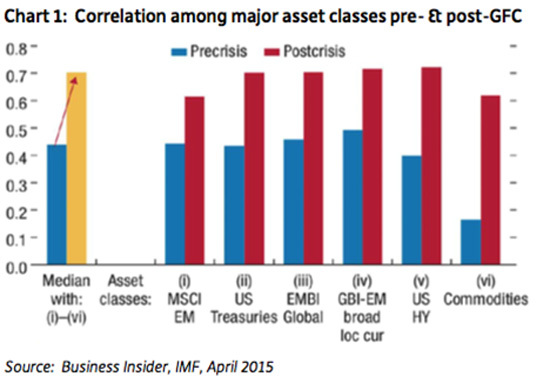 The GFC changed how risk assets correlate with each other (chart 1), and when the correlation between risk assets approaches one, diversification does little to reduce the overall volatility risk. Now the good news – it looks as if the correlation between risk assets – or at least between different types of equity risk – is finally coming down (chart 2). 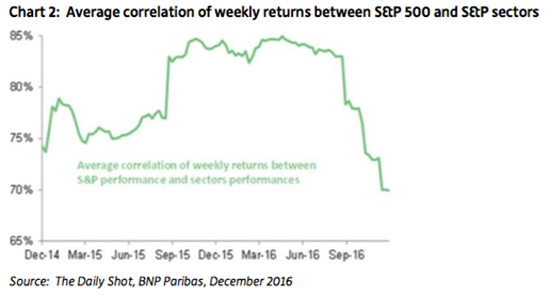 As you can see, the correlation between the S&P 500 and the average equity sector has fallen quite dramatically over the last six months. This is not the only dynamic that needs to change for me to become more optimistic, but it is an important one. Expect me to dig deeper on this topic at some point in 2017. As we enter 2017, what should we worry most about? One factor appears to be standing out head and shoulders above everything else, and that is what is usually classified as growing nationalism. It forced the UK out of the EU, and it got Trump elected in the US, but I am not even convinced that the true driver is just growing nationalism. As you may recall, national income is ultimately shared between capital and labour, and I think capital has belittled labour for too long by taking an ever larger share of national income. Frustrated by the stagnation in living standards, the man on the street wants something to change. The decision to vote for Brexit (or Trump) was a plea for change, as much as it was a sign of growing nationalism. When your own living standards are under pressure, the last thing you want is an army of immigrants to come in and put you under even more pressure. Stagnating economic growth and low – or even negative – real wage growth has created a deep level of dissatisfaction that the electorate chose to use politically, and the Brexiters (and Trump) took advantage in spades. 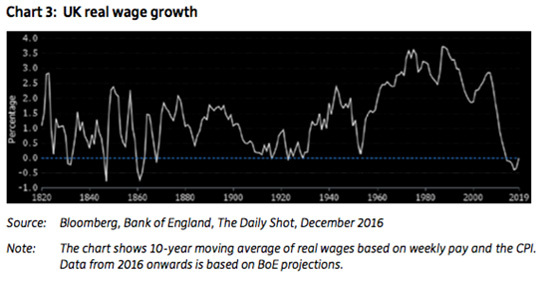 For the first time in 150 years, the average Brit is now facing falling real wages (chart 3). That the low or negative growth in wages is driven by entirely different factors and have nothing whatsoever to do with Brussels is being conveniently ignored. Meanwhile, the political leadership in the UK is facing a very tricky year, with the real opposition to the ruling Conservative Party coming not from the Labour Party but from inside its own ranks. The Brexiters want Theresa May to act now, even if all logic would suggest that the country may be better off counting to 10 before any moves are made. As 2017 progresses, we face important elections in the Netherlands, Germany and France. The Dutch will kick it all off on the 15th March with the extreme right-wing leader of the Freedom Party, Geert Wilders, currently in pole position. On the 23rd April, the French will be asked to choose their next president. If no outright winner is found in the first round, a run-off between the top two will be held on the 7th May. German general elections will follow in the autumn. The date hasn’t been set yet, but German law prescribes the 2017 elections to take place in either September or October. Radical forces in all three countries are on the roll and, given what happened in the UK and the US last year, and what happened in Berlin just before Christmas, nothing should be taken for granted. As far as nationalism is concerned, we are also about to learn whether Trump walks like he talks, and we are saddled with a certain Mr. Putin in Russia, who clearly knows how to take advantage of rising nationalistic sentiment. All in all, 2017 could shape up to be a most interesting year. That said, growing nationalism and the implications of negative real wage growth are by no means the only things we should worry about as we enter 2017. In the US, equities are very expensive irrespective of how they are valued (charts 4 a-b). Investors have ignored fundamentals in recent years and instead focused on the liquidity provided by the Fed through QE and other means of monetary policy. This has created equity valuations in the US that almost certainly will come back and bite investors in the derriere at some point. The only question is whether it is going to happen this year or ...? 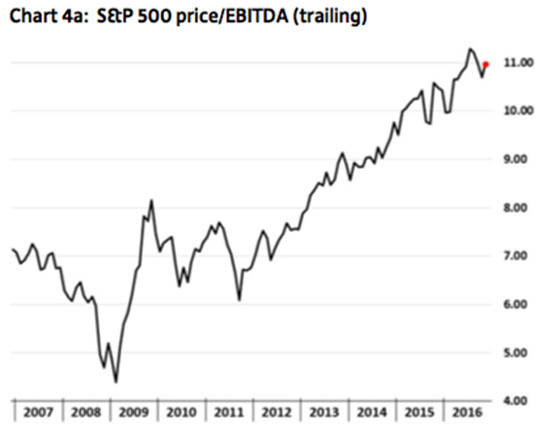 Take chart 4a (price/EBITDA). When acquisitions are made, most companies are acquired at valuations well below 10x EBITDA. If the average company in the S&P 500 now trades at 11x EBITDA, interesting M&A deals are likely to be few and far between. Companies on the acquisition trail simply cannot justify to pay 12x, 13x or even 14x EBITDA for their acquisition target, removing an important pillar for higher equity prices. Chart 4a also confirms a point I have made in previous Absolute Return Letters, i.e. that US equities are very expensive on a cash earnings (EBITDA) basis. 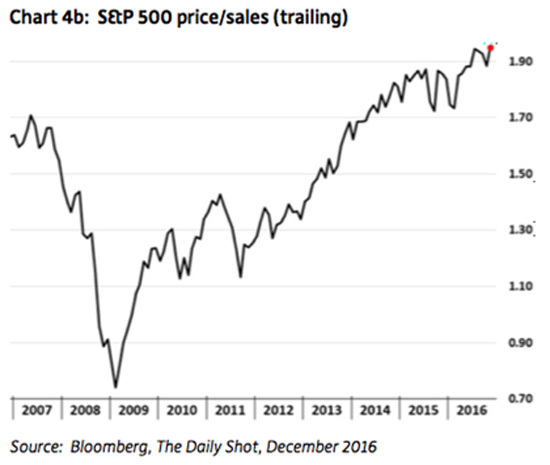 Many US companies ‘mislead’ investors by reporting solid EPS numbers (by buying back their own shares), but chart 4a tells a very different story. Let’s return to Europe for a minute or two, as there is an entire menu of potential problems to choose from. The constitutional crisis in the EU could worsen dramatically if either the Netherlands, France or Germany were to choose the ‘wrong’ leader later this year. Putin, who is clearly on a roll at present, could quite possibly upset the cards even further – in particular if the new leadership is relatively inexperienced. In Italy, the banking crisis is an accident waiting to happen. Most Italian banks are seriously undercapitalised and will need many billions of euros of new equity capital. However, under European law, equity investors must take the first hit before the government steps in, but how that will all unfold in Italy, only time can tell. Given the size of the Italian economy compared to the Greek one, you shouldn’t be overly surprised if the Italian banking crisis were to create bigger problems for the Eurozone than Greece ever did. My alter ego (the more sinister side) would even assign a meaningful probability to the entire euro currency system collapsing, with the member countries forced to re-introduce their original currencies. This would require for the Italian banking crisis to escalate further, and for either the Netherlands, France or Germany to exit the Eurozone. It is certainly not my core scenario, but it is not as far-fetched as some investors believe it is. Brexit could also cause considerable damage to the European economy in 2017. Cocky British newspaper editors have left people with the impression that Brexit means nothing; it was all a storm in a teacup, they say, conveniently ignoring the fact that the ramifications of Brexit are yet to be felt. A hard Brexit will certainly be bad for the British economy, but little will change until people begin to lose their jobs. That said, a hard Brexit is likely to be even worse for the rest of the EU than it will be for the UK (as the EU is a net exporter of goods and services to the UK). I am not entirely convinced, though, that the full impact will be felt in 2017. These negotiations could take a long time – certainly longer than the couple of years that appears to be the consensus. My next worry is the rising indebtedness across emerging markets combined with weak EM currencies. 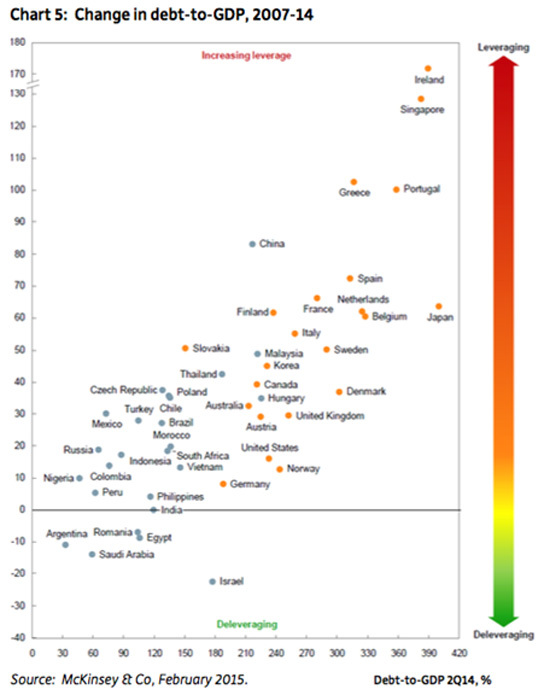 Overall debt levels, in developed market (‘DM’) countries as well as in EM countries, are much higher today than they were when the GFC nearly took us all down in 2007-08 (chart 5). Although I am also worried about debt levels in DM countries, I think the risks associated with excessive debt are higher in EM countries than they are in DM countries, and that has to do with the implications of FX movements. 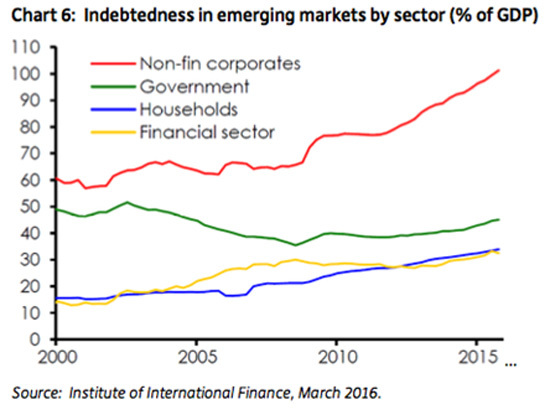 EM non-financial corporates have continued to accumulate debt as if there is no tomorrow (chart 6). As DM interest rates continued to fall, those corporates increasingly switched to borrowing in US dollars. Given the recent strength of the US dollar – in particular when measured against EM currencies – that decision has been a spectacular own goal. What appeared to be very cheap borrowing costs turned out to be anything but. USD 890 billion of EM bonds and syndicated loans (an all-time high) are coming due in 2017 with almost 30% of that denominated in US dollars. Weakening EM currencies vs. USD has been akin to a significant rise in interest rates for EM borrowers, and the possibility of a high profile accident or two should not be disregarded. I am not close enough to the EM corporate sector to tell you exactly how bad it is, but I am told it is pretty bad out there. I have written extensively already about the consequences of very low interest rates for insurance companies, pension funds, local authorities, and therefore ultimately governments and shall not repeat myself. Suffice to say that, should rates stay this low, it is only a question of time before somebody noteworthy blows up right in front of us. So far, all these very exposed entities have been able to extend and pretend, but it won’t last. As long-term readers of the Absolute Return Letter will know, I expect interest rates to stay low for a very long time to come – particularly in Europe. It is possible that US interest rates will go through a cyclical upswing over the next year or two, but the longer term (structural) trend is still down – unless our political leaders take drastic action (see what could be done in the December Absolute Return Letter here). Consequently, somebody will almost certainly default. It is only a question of who and when. Obviously there are the explicit defaults, and there are the implicit ones. Increasing the retirement age meaningfully, and implementing a mandatory conversion from defined benefit plans to defined contribution plans with a built-in haircut would translate into an implicit default, but before the unions bark too loudly, they’d better realise what the alternative is. Local authorities in the US are at the very front of the bankruptcy queue. Take the state of Illinois with over $200 billion of pension liabilities, much of which is unfunded. I am not saying that the state of Illinois will go bankrupt. If I went through the books of every single US state, I am sure I could find a few that are in an even worse condition. 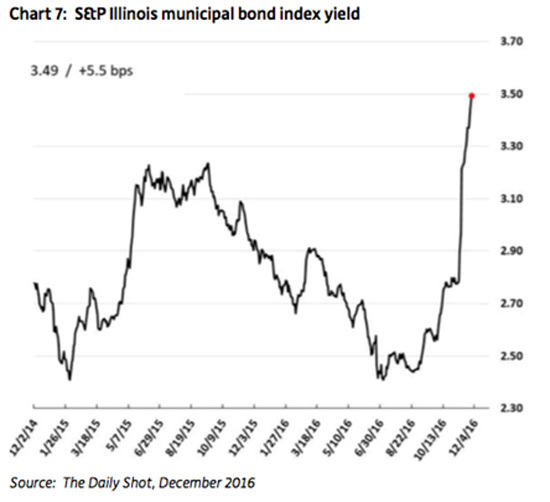 That said, the 1% rise in municipal bond yields since July (chart 7) could turn out to be not the buying opportunity that many argue it is, but still a great shorting opportunity despite the recent rise in yields, should the situation be as bad as I suspect it is. I think I will stop here. I could list quite a few other candidates for hiccup of the year 2017, but those that I have mentioned above are the ones I believe are most likely to do meaningful damage in the year to come, should they unfold. I haven’t mentioned the fact that the current economic cycle is getting very long in the tooth. The last recession ended in early 2009 and the next one will undoubtedly commence not too long from now. Could it possibly happen in 2017? I don’t know, and I don’t think anybody else does either, despite the fact that about 1⁄2 million commentators claim they do. 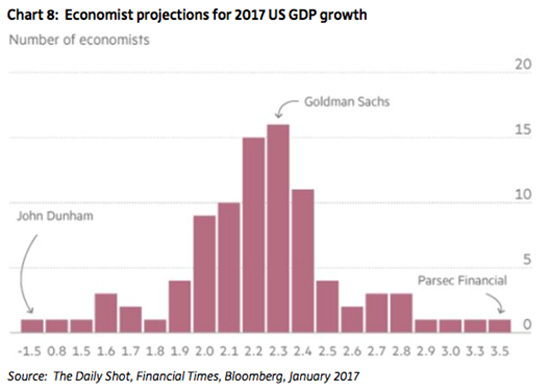 GDP growth projections for 2017 follow an almost perfect normal distribution, suggesting to me that few economists have a very clear idea what sort of conditions 2017 is likely to bring (chart 8). If I were a betting man I would bet against a recession in 2017, though, as almost everyone does in chart 8. There seems to be a great deal of momentum in both the US and the EU economy at present, and I see nothing to change that in the short term. However, the Fed could quite possibly ignite the next recession, should it be necessary to tighten more in 2017 than they have already indicated. Based solely on US domestic data, they should probably have tightened a great deal more than they actually did in 2016, but weak data elsewhere kept them sitting on their hands – most likely because they didn’t want the US dollar to appreciate too much. That could potentially force them to tighten more than they would like in 2017. An increasingly capacity-constrained US economy could lead to rising inflationary pressures, but that is more likely to be an issue for 2018 than for 2017, I suspect. Neither have I mentioned China at all, but China could certainly blow up. After all, the credit bubble appears to be bigger in China than anywhere else. How that will all pan out I don’t know, but I have learned over the years that normal rules do not apply in China. Despite what the rulers want us all to believe, it is most definitely not a proper market economy; hence applying normal logic doesn’t work as far as China is concerned. Investing in China is about knowing the right people and little else. In our part of the world you would most likely go to jail if you applied that investment technique, but not in China – at least not so far. The combination of Brexit and Trump has generated significant momentum for nationalistic forces worldwide, and one would be foolish to conclude that the worst is over. I certainly expect at least one of the forthcoming elections in Europe to deliver an outcome that will create further problems for project EU, but don’t assume that I am bearish on the euro for that reason. Yes, low economic growth across the EU will almost certainly lead to further USD appreciation vs. EUR, but a complete collapse of the euro currency system – or at least a reconfiguration (the latter of which I think is the more likely outcome) – will not necessarily cause the euro to weaken. It will all depend on how the crisis is handled. The timing of the forthcoming weakening of US equities (which I consider a given) will to a substantial degree depend on when the US economy goes into reverse and, as I said earlier, that is more likely to materialise in 2018, but it could certainly happen as early as 2017. Some sort of emerging market crisis driven by a combination of high USD- denominated debt and weak EM currencies is my prime candidate for hiccup of the year, but it is not entirely clear what the implications will be for developed markets – sort of depends on where it happens and to what degree DM banks are implicated. Generally speaking, though, DM banks are only modestly involved in emerging markets these days; hence an EM crisis doesn’t necessarily imply that we all get sucked in. You would be forgiven for thinking that, from an investment point-of-view, the not insignificant risks laid out in front of us makes it virtually impossible to construct a portfolio that is likely to generate an attractive return in 2017, but nothing could be further from the truth. Firstly, remember what I said earlier. I usually focus on the negative aspects when investing; hence my writing also has a negative bias. That is not the same as saying that I am always bearish, and I am most definitely not particularly bearish going into 2017. Secondly, given the risk factors mentioned above, I would emphasise alpha risk over beta risk at this (late) point in the economic cycle. There are indeed many ways that can be accomplished, and that is precisely what next month’s Absolute Return Letter will be about. This month’s letter is already too long, so all I will do for now is to wish you a very successful 2017. As a purely intellectual exercise it is worth looking at the upsides of 2017, since we are all well aware of things that could wrong. The single biggest upside — and not a particularly improbable one either — would be a victory for Emmanuel Macron in the French presidential elections. For the first time, an opinion poll has put the former economy minister, who is running as an independent, ahead of François Fillon, a former prime minister, who is the official candidate of the centre-right Republican party. By French standards they are both radical economic reformers, though they differ in their radicalism. Mr Fillon is the more extreme. He wants to get rid of the 35-hour week, increase the pension age and slash public sector employment by more than half a million. If he wins and manages to implement his agenda, France would go through a period of extreme liberal deregulation. Politically, Mr Fillon is in the tradition of French souverainisme: a doctrine that opposes a federal version of European integration and sees the nation state as the main political anchor in the continent’s politics. It is perhaps no accident that Mr Fillon enjoys excellent relations with Vladimir Putin, the Russian president. Mr Macron, too, wants economic reforms beyond anything the French establishment, especially the Socialist party, would likely ever agree to. But he is the opposite of a souverainiste: he wants a fiscal and political union for the eurozone because he recognises that the only nation state that benefits from the current political arrangements in Europe is Germany, not France. In that sense, he is the polar opposite of Marine Le Pen, leader of the rightwing National Front. Mr Macron wants to make the eurozone work; Ms Le Pen wants to destroy it. It is less clear what implications a Fillon victory would have. Like other Republican politicians he has no grand designs for Europe or for the eurozone. Unlike his predecessors, his economic radicalism might end up producing economic convergence with Germany, though I would not advise anyone to take this course since Germany is unique in its economic and social structures. It has a much stronger manufacturing sector than France. But I am ready to concede that a strategy of economic convergence is, in theory at least, a viable “third way”. So we have three politicians with three clearly delineated strategies. There are other candidates. The Socialists will determine their official contestant in a primary this month. But let us assume that the presidential election will be a race between Messrs Fillon and Macron and Ms Le Pen, who happen to be the three strongest performers in the opinion polls right now. While the relative attractions of Mr Macron or Mr Fillon are easy to see, what would be the economic impact of a victory for Ms Le Pen? There are many good reasons to detest her and her party but liberals should not repeat the mistake they made during Britain’s EU referendum campaign and the US presidential election, when they predicted an economic meltdown that did not happen. 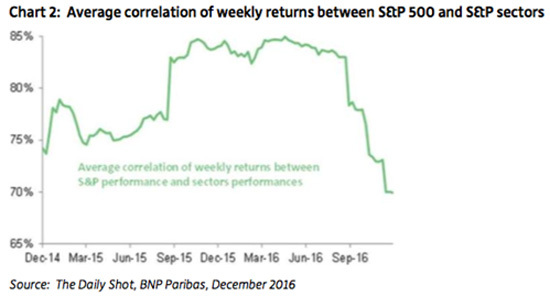 Both the Brexit vote and the victory of Donald Trump were followed by an increase in stock prices. There were good reasons to oppose Brexit and Mr Trump. But the economic arguments mounted against them were at best exaggerated and narrow-minded. I would look at a hypothetical Le Pen victory in a similar way. Her presidency would kill the European dream. It would destroy the euro. But I cannot exclude the possibility that it might be good for the French economy or that it might produce a stock market boom. A euro without fiscal transfers is economically equivalent to the gold standard in the early 1930s. The earlier countries came off the gold standard, the earlier their recoveries started. In this narrow sense, Ms Le Pen and Mr Macron constitute two opposed but viable options, both economically preferable to an unsustainable status quo. And Mr Fillon represents a more realistic version of the status quo than anything that has been tried before. Each position, while internally consistent, is also risky. It is far from clear whether Mr Macron can persuade Germany to agree to a fiscal union. But if any outsider can, it must be the French president. It is far from clear that Mr Fillon would be supported by an equally reformist parliamentary majority. Nor is it clear that Ms Le Pen could manage a viable economic policy outside the eurozone. From an investor’s perspective, each of those candidates holds the potential of an upside risk. The 1930s taught us that the unsustainable always ends and that muddling through never works, although it always looks attractive to the economically illiterate at the time. The failure to heed this lesson is the reason why centrists have been losing everywhere in recent years. The events of 2016 are consistent with that observation. The upside potential for 2017 consists of the possibility that a morally corrupt liberalism might give way to something more sustainable. But be careful what you wish for. The economically optimal outcome might be loathsome for other reasons. In the coming year, the United States will remain the overwhelmingly dominant geopolitical power in the global system, and President-elect Donald Trump will be at the helm. His presidency will mark a turning point as the first significant shift towards nationalism at the center of the US political system. As explained in our 2017 forecast, this rise in nationalism is a global trend, and one of three critical consequences of the 2008 financial crisis that will play a pivotal role in shaping geopolitics in 2017. (The other two are economic stagnation and instability in export-dependent countries.) Its rise stems from the rejection of the internationalist model that has dominated international relations since the end of World War II. In places like Europe, it is easy to see why internationalism is losing favor. It is less obvious for the US. The European Union (EU) put in place policies and regulations that prioritized the Union’s survival over national interests, and this inherently creates conflicts of interest between the bloc and member states. This was exacerbated by the 2008 financial crisis. Member countries saw their economies crash while their hands remained tied by Brussels, which was slow to act and offered a narrow range of Band-Aid solutions. Unlike the EU, the US government does not answer to any regional blocs or international powers. And yet, like the EU, the US will continue to see a strong rise in nationalism in the coming year. Our forecast states that internal stresses will be reflected in US foreign policy, one of the few areas where the president has a say. While our forecast explains what these effects on foreign policy will look like, here we explain the less obvious forces causing nationalism to rise in the US. Historically, the US has experienced some type of internal crisis approximately every 50 years. The book, “The Next 100 Years,” details the nature of these past crises and their paths toward resolution. Since its founding, the US has confronted an economic and social crisis every 50 years—the most recent starting with the election of Ronald Reagan in 1980. Approximately a decade before a crisis starts, new socio-economic problems begin to emerge. Trump’s election does not mark the arrival of a crisis, but it does foreshadow the anticipated arrival of one in the 2020s. The defining internal economic problem confronting the US today is a decline in the middle class’ purchasing power. According to our calculations, the take-home pay for a median income earner—after taxes and other deductibles, and assuming employer-provided health care—totals about $3,600 a month. At current interest rates, that would be enough to purchase a home and a car, and maintain them without savings. A worker in the lower-middle class would earn about $2,000 a month after taxes and with employer-provided health care. That person would no longer be able to afford more than rent for an apartment. A generation ago, members of the middle class could not only buy a home, they also could enjoy an occasional indulgence, vacation, or superfluous purchase. One of the key groups most affected by this decline in purchasing power is the white working class. While it remains the single largest ethnic and social group in the country, this group found itself increasingly lacking in political representation. Political party lines put in place by the New Deal coalition saw the Democratic Party represent workers and the Republican Party the upper-middle class. But an electoral shift that started in the South in the 1960s sparked culture wars between parties, and Democrats cut ties to one of their former bases: blue-collar workers without college degrees. It is reasonable to expect that these grievances would influence this demographic’s voter behavior. Trump astutely tuned in to this demographic and used it as his base to win the election. It should be noted that any politician—it didn’t have to be Trump—who could successfully appeal to this group would have been a strong candidate in the November election. The rise of US nationalism reflects the fact that extended economic dysfunction has inevitable political consequences. These consequences play out at the intersection of the emerging domestic socio-economic crisis and global economic stagnation. From 1991 to 2008, the accepted wisdom was that the more efficient an exporter nation, the stronger its economy. In reality, exporters are only as strong as demand. The 2008 financial crisis challenged core ideas that promoted the benefits of free trade. The crisis’ other two major consequences were economic stagnation in advanced industrial countries and increased instability and insecurity in export-dependent countries. Post-crisis, export-dependent economies were no longer strong but rather weakening and vulnerable. Free trade now must prove its worth, as protectionism—the economic expression of nationalism—gains momentum. Both the World Trade Organization and the International Monetary Fund have noted a decrease in world trade levels and assume there is a direct correlation between growth in trade and growth in GDP. The relationship between trade and GDP is clear, but no one has actually figured out what that relationship is. A 2008 study by the US International Trade Commission (USITC) concludes that “all the empirical analysis” confirms a link—but none of the empirical analysis points to where the causality lies. The USITC study also points out that for developing countries, whether trade liberalization helps or hurts remains unclear. The balance between free trade and protectionism has been a major political issue in the US since the country’s founding. While the US economy remains relatively protected from a decline in exports—which account for only 12.6% of GDP—the crisis created space for a re-evaluation of trade relationships. These trade conversations tied directly to the growing US domestic debate over declining purchasing power and standards of living. Moving to the forefront of national conversations were the questions of job loss from industrial shifts associated with free trade, depressed wages due to global competitiveness, and loss of market share for domestically produced products. When self-interest becomes the focal point of an argument, it is likely to spread to other dimensions of society and politics. The discussion about economic survival bleeds into larger national questions about immigration policy, military commitments abroad, trade agreement terms, and foreign aid—among others. Furthermore, populations will head towards the path that provides the best advantage. Today, nationalism looks increasingly attractive. For those who suffered after the 2008 crisis, internationalism has not only failed to solve the world’s current political, security, and economic crises, but it’s also seen as the cause of those problems. This shift towards nationalism in the US should not, however, be overstated. In the US, and at a global level, nationalism may not simply triumph. But this requires internationalism to reinvent itself in a way that seems like a viable alternative. Trump’s election is the first step in this extended process. Except in the event of war, foreign policy shifts do not happen quickly in the US. The US is undergoing internal stresses that will inevitably be reflected in its foreign policy, which is further explained in our 2017 forecast. WASHINGTON, DC – US President-elect Donald Trump is filling his cabinet with rich people. According to the latest count, his nominees include five billionaires and six multimillionaires. This is what is known as oligarchy: direct control of the state by people with substantial private economic power. Given that the Republicans also control both houses of Congress – and will soon make many judicial appointments – there is virtually no effective constraint on the executive branch. In many instances – including the United States today – the initial reaction to such a government includes the hope that perhaps rich people will be good at creating jobs. They made themselves rich, goes the logic, so maybe they can do the same for the rest of us. Hope usually dies last, but the incoming administration’s proposed economic policies are not encouraging. The organizing principle seems to be to discard pragmatism entirely and advance an extreme and discredited ideology. The central theme of Trumponomics so far has been swift and sharp tax cuts. But Mick Mulvaney, Trump’s pick to run the Office of Management and Budget (OMB) is a prominent and articulate deficit hawk; he will have a hard time supporting measures that increase the national debt. To some extent, tax cuts will be justified with overly optimistic projections regarding their impact on economic growth, as was done under President George W. Bush, with generally disastrous effects. But there is a limit to how much pressure can be put on the Congressional Budget Office, which is responsible for providing credible assessments of the fiscal impact of new policies. Trump seems determined to lower income taxes for high-income Americans, as well as to reduce capital-gains tax (mostly paid by the well-off) and nearly eliminate corporate taxes (again, disproportionately benefiting the richest). To do this, his administration will seek to increase taxes on others, and now we are beginning to see what this will look like. People close to the president-elect are considering an import tariff, set at around 10%. This tariff will undoubtedly be presented to the public as a move to make American manufacturing great again. But a tariff is just another name for a tax that increases the costs of all imported goods. But the cost per job will be high: all imports will become more expensive, and this increase in the price level will filter through to the cost of everything Americans buy. In effect, the oligarchs will reduce direct taxation on themselves and increase indirect taxation on everyone – much like increasing the sales tax on all goods. Under any such proposal, the burden of taxation would be shifted from the better off to those with less income and little or no wealth. And that may be just the start of the negative impact on most Americans’ wellbeing. If Trump increases tariffs on imported goods, some or all of America’s trading partners will most likely retaliate, by imposing tariffs on US exports. As US export-oriented firms – many of which pay high wages – reduce output, relative to what they would have produced otherwise, the effect will presumably be to reduce the number of good jobs. Some countries – such as China – may deploy other punitive measures against US firms operating on their territory. The net effect will again be to reduce employment, both worldwide and in the US. The world has had much experience with “trade wars,” and it has never been positive. Why would a group of American oligarchs pursue such a disastrous policy? The Trump administration is taking shape as a coalition of businesspeople who wrongly believe that protectionism is a good way to help the economy and market fundamentalists who now dominate the Republican caucus in the US House of Representatives. Before Trump’s rise to prominence, the House Republicans were developing a set of policies structured around deep tax cuts, sweeping deregulation (including for finance and the environment), and repeal of President Barack Obama’s signature health-care reform, the Affordable Care Act (“Obamacare”). They were, however, resolutely in favor of freer trade – and the Obama administration’s plan was to enact the Trans-Pacific Partnership (TPP), a free-trade agreement with 11 other Pacific Rim countries, with substantial Republican support in Congress. Trump’s election has not changed the core House Republican agenda – in fact, it has brought that agenda’s architects into government, at OMB, at the Department of Health and Human Services, the CIA, and other prominent positions, with more likely to follow. As my colleague James Kwak explains in his new book Economism, their pro-market thinking has gone too far and is unlikely to lead to good outcomes. Selling Trump’s signature issue – protectionism – to the House Republicans was not easy. But now they have started to think about an import tariff as part of their tax “reform” package, they will all start to get on board. And they will offer various strange justifications that deflect attention from the essentials of their policy: lower taxes for the oligarchs and people like them, and higher taxes – not to mention significant losses of high-paying jobs – for almost everyone else. The world seems a very uncertain place lately. But try telling that to the stock market. To judge from the news headlines, the past year has been full of dangerous surprises. Last winter a thicket of debt, emerging market, dollar and commodity-price woes sent off recession warnings. Next, there was Britain’s vote to leave the European Union. And then the upending of the U.S. political status quo in the election of Donald Trump. Indeed, as measured by an economic policy uncertainty index developed by economists Scott Baker, Nick Bloom and Steven Davis, this counts as a perilous period. Yet the stock market hasn’t only been unusually calm, it has been calmer than usual. The standard deviation of the S&P 500’s daily moves in 2016—its typical swing—was 0.8% versus 1% in 2015. Last quarter, the stock market posted its calmest performance in a decade. The decline in volatility has been matched by a decline in the Chicago Board Options Exchange Volatility Index, or VIX. The VIX measures how much options to protect against volatility cost; right now those costs are low, suggesting investors aren’t worried about what is coming down the pike. It is an odd situation. The policy uncertainty index is based on criteria including flagged word combinations in news articles and the level of disagreement among economic forecasters. In the past, when it has been high, stock market volatility and the VIX have been high as well. Volatility has always been a bit of a puzzle—stocks shake around a lot more than the underlying fundamentals suggest they should. But now would be a funny time for the market to start acting the way financial theorists say it should. Another possibility is that stock-market investors don’t care all that much about politics, and since the recent round of uncertainty is political in nature (as opposed to the uncertainty surrounding the 2008 financial crisis), it isn’t hitting stocks. The problem there, says Mr. Bloom, is that the market clearly does care about politics—witness its move since election day. He thinks a more likely reason volatility is low is that the hurdles the economy could face in the new political climate, such as the erection of trade barriers or a hard tack against immigration, aren’t going to come about in the very near term. Put different, investors aren’t looking much further than the end of their noses, and it won’t be until their noses run up against real trouble that they’re likely to react. Editor's Note: As another year begins with yet another cease-fire in Syria, the disintegration of Middle Eastern states is evident. Therefore, we are republishing this article from Dec. 9, 2015 in which we explain why it may not be possible to talk about the Arab world as a whole anymore. Turkey and Iraq are engaged in a diplomatic spat. The dispute is over Turkey placing troops and armor inside of Iraq’s borders ostensibly to train Kurdish peshmerga fighters, as well as Arab Sunnis and Turkmen, to fight Islamic State without Iraq’s permission. The number of troops at this point – Reuters reported it to be about a battalion, so between 400 and 1,000 troops – is not enough to change realities on the ground by itself. It may be that Turkey is in the very initial stages of either participating in or helping to plan an offensive on the Islamic State-held city of Mosul. Even if it is, such a development is a long way off. The deeper issue is that Turkey, a non-Arab country, felt it could station troops in an Arab country without having to be concerned with that country’s reaction – in this case, Iraq. We speak often of Turkey’s strengths and advantages compared to other would-be regional powers: it has a strong military, a strong economy, it controls some of the most strategic real estate in the world as the gatekeeper to the Bosporus. The flip side of this is the weakness of the region’s Arab states. Indeed, it may not be possible to think of the Arab world as a whole anymore. Like the terms “Syria” and “Iraq,” the term “Arab world” has become a hollow phrase. Since the peoples of the Middle East encountered Western imperialism in the late 19th and early 20th centuries, the word “Arab” has referred to the notion that the Arabic-speaking people of the region constitute a nation to themselves. The various borders drawn by Great Britain and France were for imperial purposes; the states that began to emerge were all part of the Arab nation. The word “Arab” however has meant many things over the course of history. As Bernard Lewis notes in “The Arabs in History,” its first meaning was to describe the nomadic Bedouin tribes of the Arabian Peninsula. After Mohammed’s conquest and the birth of the caliphate in the 8th century, the term was used often to distinguish between the Arabian conquerors and the masses of the conquered. Over time the term lost its explicitly ethnic content, becoming a social term which described a class of people who tried to preserve the old nomadic ways, though the importance of Arabic language remained constant. It gradually became imbued with its now-familiar nationalist ideas towards the end of the 19th century. At Geopolitical Futures, one of the core principles that informs our work is the importance of the love of one’s own. The international system is based on the existence of nation-states, and the foundation of the nation-state is the natural love of what one considers to be one’s own people. Nationalism uses the love of one’s own as the bedrock out of which to establish the nation-state – which is precisely what Arab nationalism tried to do in the second half of the 20th century after casting off the imperial yoke. There is a rough equivalent to the love of one’s own in Arabic thought, a concept used prominently by the famous historian Ibn Khaldun, who wrote and lived in North Africa in the 14th century. Ibn Khaldun wrote of a concept called “asabiyya,” which roughly translates to “social solidarity.” Ibn Khaldun thought that the nomadic Bedouin – the original “Arab” – destroyed civilization but founded states. This was because the Bedouin had a natural asabiyya, one that Albert Hourani described as a “mutual affection and willingness to fight and die for each other.” With asabiyya came the strength and courage to defeat civilizations, and which allowed for the formation of states after conquest. Once the state was established, a new asabiyya had to develop, one that put the state before all else. But Ibn Khaldun recognized that in this region, the relationship of soldiers and citizens to a state could never be as strong as the primal asabiyya that exists between those related by blood and not by political convention. With the exception of Saudi Arabia and a few other monarchies, like Jordan and Morocco, the political structure of the Arab-national world came to be dominated by two main ideologies imported from Europe: socialism and nationalism. From Algeria to Iraq, socialism and Arab nationalism were the asabiyya that held these brand-new states together. These ideologies, however, have failed to fulfill their promises. Socialism did not bring prosperity to the masses. The existence of independent nation-states did not usher in an age of freedom – in fact, it propped up authoritarian dictators. IS is one response to the failure of these ideologies. IS lives in the world of the failure of socialism and Arab nationalism, and all of its targets in the Middle East – Syria, Iraq, Yemen, Libya, Tunisia, Lebanon – are states to varying degrees where the cohesion of the state has broken down as a result. It is easy to dismiss IS as a bunch of violent radicals, but the fact of the matter is IS’ ideology appeals to Arabic-speaking Muslims in the Middle East as well as many non-Arab Muslims around the world. Islam is the only thing that has ever succeeded at uniting the various tribes and clans and ethnic groups scattered across the region into a whole. In a similar way to the European fascists, who used nationalism to establish legitimacy and communal bonds, IS harkens back to an imagined golden age where the only thing that was important was whether one was a true believer or not. But another manifestation of the breakdown of Arab political power is in the fact that on Dec. 4, Turkey reportedly deployed 220 Turkish troops backed by approximately 8 tanks and other support elements to the towns of Zlekah and Bashink outside the IS-held city of Mosul. Also, on the same day, the Turkish military released details of a training program for Kurdish peshmerga fighters that it has been engaged in for over two and a half years. Iraqi Prime Minister Haider al-Abadi characterized the news as a violation of Iraqi national sovereignty, and he wasn’t wrong. And yet all the broken state of Iraq can do is to threaten to take it up with the UN Security Council, or to make calls to NATO officials and Kurdish political leaders, as Abadi has done in response. Abadi does not have the national strength necessary to do anything besides take offense. Turkey can bomb northern Iraq to hit PKK positions when it likes, and it can station troops outside Mosul if it chooses. Whether Ankara’s motives are to train the peshmerga against IS, to send a signal to the Russians, to halt the successes of the Syrian Kurds matters little. Turkey, if it wishes, can do as it pleases in Iraq right now. This is not just an Iraqi issue. Or a Syrian issue. The most capable “Arab” state left is Saudi Arabia – and the Saudis do not speak to any broad coalition of people within the region itself. The influence they have is a result of money and previous American support. Egypt has its own economic and security issues; the beating heart of pan-Arabism flat-lined decades ago and nothing has arisen in its place. Libya no longer exists. Yemen is a permanent war zone. There is no Arab unity. There is tribalism and factionalism and sectarianism. There is primal asabiyya – small groups battling to survive for the sake of surviving and protecting their own. The age of the Arab caliphates ended when the Mongols besieged a Baghdad already weakened by centuries of Turkic and Persian attacks in the 13th century – from that point on, until after World War I, the Arabic-speaking peoples of the Middle East were ruled by foreign powers, and for the bulk of that time by the Turkic Ottoman Empire. The period from roughly 1918 to 2011 was a rare moment in history where Arab states controlled their own destinies far more than they had in previous centuries. That time, however, has come to an end. The Arab world in so far as it exists is completely fractured, so much so that the very notion of speaking about the “Arab world” in a way that transcends clan, tribe, or sect is quickly losing any real meaning. And this is the usual state of affairs in this part of the world. The region has always been a magnet for competition between great powers – the Ottomans and the Safavids, the Americans and the Soviets. Today, military elements of the U.S., Russia, France, and the UK are all active in the region. Persian Shiite Iran wields a tremendous amount of influence in Baghdad via the Shiite militias it funds, and throughout the region with its various proxies. Turkey is being drawn into the vortex that Islamic State has created within the old Syria and Iraq borders. The Kurds are caught between it all, with the Turks using some clans and tribes for their own purposes, and fighting others as necessary. People look at the Middle East as if it is in chaos but really the region is reverting to a familiar state of affairs. The exception has been the last 100 years or so. The present is familiar to the student of history. The Turks have little interest in making what’s left of Iraq angry. Ankara will do what it can to assuage Abadi’s hurt feelings. Even so, there is something remarkable happening here to take note of. It has become increasingly hard to speak of the Arab world as anything beyond a vague description of the Arabic-speaking people of the Middle East. There is the Islamic State and there is narrow asabiyya. For the time being, the region’s fate rests ultimately in the inevitable clash between the former and foreign powers.